I live in the Pacific Northwest and most of my diving has been in the waters of Puget Sound, Hood Canal and the inland waters of British Columbia. When I have had the opportunity to dive in places with warmer water most folks ask how I can stand the cold water. My answer is simple: the abundance of life in cold water is endless, and the creatures I see while diving often deliver surprises. 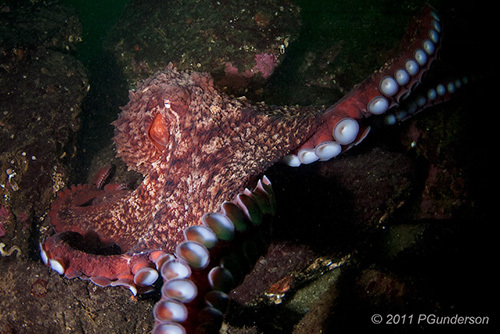 One of the most well known animals in our local waters is the Giant Pacific Octopus, (Enteroctopus dofleini). This cephalopod is very intelligent and inquisitive. They can frequently be found in a den during the day and outside hunting at night. Each GPO also seems to remodel its den just to its liking. On one dive I was swimming along when I saw a huge cloud of sand erupt from a den, followed by the octopus throwing shells and rocks out. You could actually see the arms pushing out the debris that was not wanted in the den. GPOs, especially large specimens, are really majestic animals when seen outside of their dens. 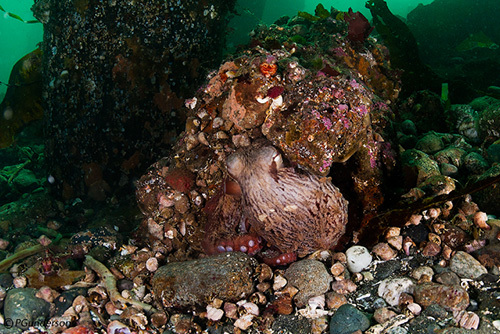 Although GPOs are usually inquisitive and not aggressive, it is important to understand that a larger octopus could do a lot of damage quickly. They have even been known to steal divers' cameras, rip off masks or descend with arms all over a diver. And while it’s exhilarating to watch a GPO exhibit warning behavior (appearing larger by extending legs and billowing out the membranes between legs), we need to remember to respect their space. This is a large specimen that came out to investigate and let me take a series of photos before it slithered back into a crevice in the rocks. This is a small GPO peeking out of the concrete pipe it inhabits. During the spring months in the Pacific Northwest there are many creatures breeding and laying eggs. 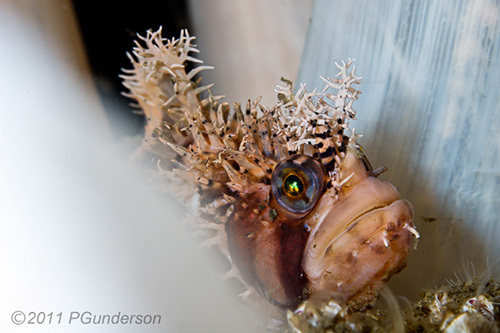 This year I was lucky enough to photograph one of my favorite fish guarding eggs, the Decorated Warbonnet (Chirolophis decoratus). They have an elongated body and can grow to more than a foot long. Decorated Warbonnets tend to hide in crevices, inside logs or sponges, and seem to be quite territorial. Friends in British Columbia have told me they can be quite nasty - even swimming out to bite fingers - although I have never had this happen to me. Decorated Warbonnet keeping a close eye on me. Another favorite fish I find in the spring is the juvenile Mosshead Warbonnet, (Chirolophis nugatory). They are much smaller than the Decorated Warbonnet, growing to about six inches when mature. Like the Decorated Warbonnet, they are long eel-like fish. 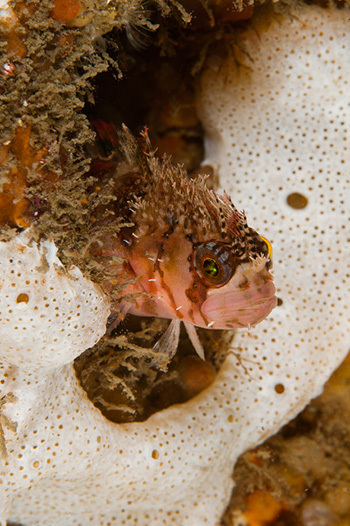 One of their favorite spots to hide is in an empty barnacle shell, and their tiny faces and punk rock-like haircuts make them a great photography subject! 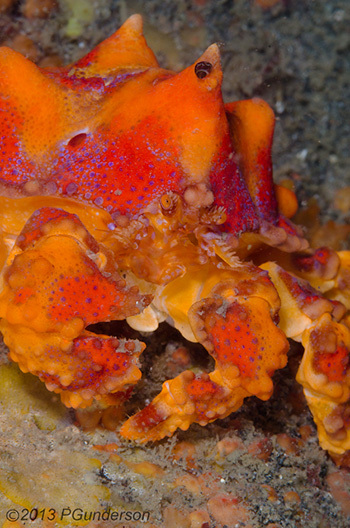 At one of my favorite dive sites, the Keystone Jetty, you can find them poking their heads out of barnacles or swimming about among the tiny orange social tunicates and hydroids. You just have to move carefully and watch for the motion of a tiny fish camouflaged within the profusion of life inhabiting the rocks there. Mosshead Warbonnets are often tought to spot. A wider perspective of a Mosshead Warbonnet. 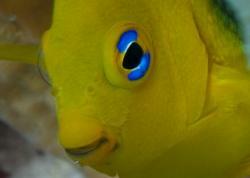 Many fish are territorial and it is fascinating to observe their behavior. 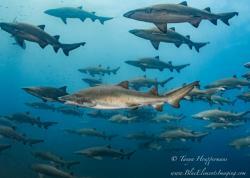 The hunt for new fish behavior is one of the things that gets me in the water time after time. 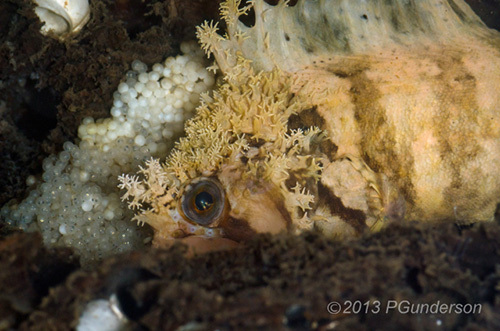 I was lucky enough to find this male Scalyhead Sculpin (Artedius harringtoni) warning off another little sculpin. He lunged out of the barnacle quickly towards the other fish while opening his mouth and exposing his yellow gill coverings. After putting on a good show he retreated deeper into the barnacle shell. 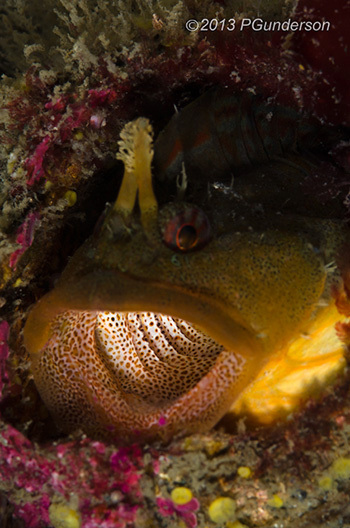 A Scalyhead Sculpin puffs out his gills and opens his mouth to warn another sculpin to stay away. 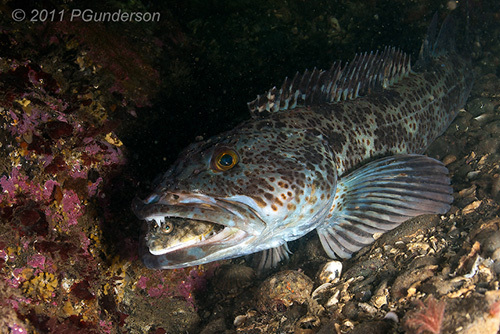 The Lingcod (Ophiodon elongatus), a large fish common in the Pacific Northwest, exhibits territorial behavior similar to the scalyhead sculpin. 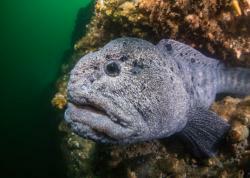 The males of both fish guard their eggs, and it is common to see Lingcod torn up during the winter months from fighting. I recently witnessed a large Lingcod swimming up to another to bite its tail - certainly appearing to be a territorial dispute. Lingcod are voracious feeders with a great liking for octopus, and I have seen them swimming around with tentacles trailing out of their mouths. The wreck of the Columbia in British Columbia north of Campbell River used to be a good place to find the Giant Pacific Octopus, but the big Lingcod living on the wreck seemed to have devoured all of them when I last visited. I didn’t see a single GPO. I have also seen Lingcod eating all kinds of fish and was lucky enough to see a large Lingcod, probably about 5 feet long, with a spiny dogfish (a small shark) sideways in it's mouth. Unfortunately, the moment was gone before I could capture a photo. Here is a photo of a Lingcod with a flatfish in it's mouth, quite a mouthful. 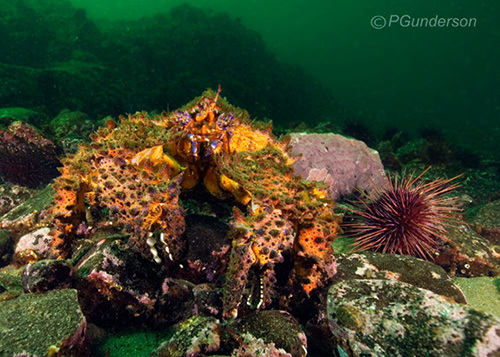 Puget Sound King Crabs are large with extremely colorful shells. The juveniles are brilliant orange, and as they get older they begin to show the purple markings of adults. The colors of mature individuals can be muted by growth on their shells, and until they molt they can be very drab. After molting, the reds oranges and purples are again brilliant! 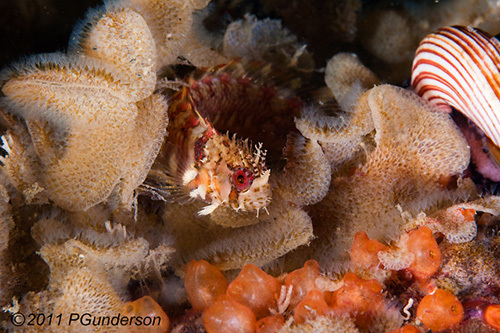 These are only a few of the interesting creatures to be found in the cold waters of the Pacific Northwest. I consider the opportunities for photography here endless and know that there will always be something new to witness. I find cold water diving every bit as exciting as the warm water diving and recommend you try for yourself.